The A-Team are in the Crossover Universe through Bobby Nash's Lance Star story "Homefront," Brad Mengel's Remo Williams story "The Roads Not Taken," and IDW Publishing's Ghostbusters series. In the first issue of this short-lived Marvel Comics series based on the TV show, B.A. 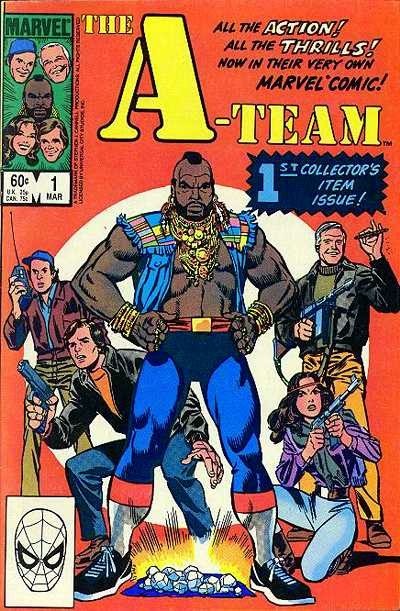 Baracus runs into an old friend, Mario Ronda, who reveals that he is an FBI agent, partnered with Bill Maxwell. Maxwell is from the television series The Greatest American Hero, which was already connected to The A-Team by the appearance of the fast food restaurant Hamburger Heaven and its mascot, Captain Bellybuster, on both series. This reference furthers cements the two shows as taking place in the same universe. I bought this mini-series when it originally came out. I remember being very disappointed that it didn't become a regular ongoing series. Just curious, but does the A-Team actually shoot people in this series?